We have no real insight into the initial ideas – but they certainly are likely to include options such as a truly pedestrian and cycle-friendly Princes Street, with most motor traffic removed, and the closure of other streets to through motor traffic. All relevant Council departments are apparently involved, not just transport, and the project is to be led through a Central Edinburgh Development Working Group which will include councillors from all 5 parties on the Council. The Transformation process follows years of ever-increasing pressure for a traffic-reduced people-friendly city centre as Edinburgh (and, notably, Scotland’s premier street, Princes Street) falls further behind comparable European cities. It was back in 2010 that international ‘Cities for People’ expert Jan Gehl called Princes Street a ‘bus station’ and George Street a ‘car park’ in his neglected report on the city centre. Sadly the then Council bottled out of any serious implementation of Gehl’s report, falling back solely into consulting on the future of George Street (a process which still chunters on). air quality … fails to meet Scottish Government standards. The project will involve rethinking transport priorities across the city in order to … provide a public realm that better meets the needs of residents, pedestrians, cyclists and a more integrated public transport network. … Edinburgh can learn from other leading cities. A major public consultation on options is expected in the summer (we hope ‘stakeholder groups’ including Spokes and Living Streets will be informally consulted before that) with decisions by the end of the year on how to proceed. Hints from councillors and officers suggest that they are thinking boldly – and they will have to if they don’t wish to be overtaken by Glasgow, whose impressive recently announced Connectivity Commission is to be headed by UK transport expert Prof David Begg. 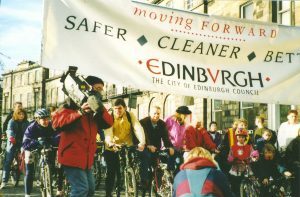 David Begg was Edinburgh’s Transport Convener (and a Spokes member) in the 1990s and took many brave initiatives on buses, cycling and walking, several of which, unbelievably, subsequent councils dismantled – including scrapping the Princes St cycle lanes he had installed (see picture) and scrapping offpeak and Saturday bus lanes. Spokes hugely welcomes Edinburgh’s Transformation process, as long as it is truly transformative and not gradually watered down in the face of motoring demands. And as long as it does not meet the filing-cabinet fate of the Gehl report. Of course, decisions such as the future of Picardy Place and Leith Street should be part of this – to contribute to the Transformation, and to benefit from it. But, sadly, the juggernaut of the St James process began around a decade earlier, with huge investment implications for the city, with planning permission long since granted for an increase of roughly 1000 car spaces, and with a legal agreement for a car-dominated Picardy gyratory (with, apparently, heavy penalty clauses). Spokes is unhappy with the basic gyratory concept and we associate ourselves with the positions put forward by Sustrans Scotland and by Living Streets. We do not need to duplicate the arguments here. Latest!! A great background article by Cllr Scott Arthur, concluding in a plea for reconsideration by the Scottish Government, the developers and the Council of the GAM financial agreement which includes the gyratory plan. The Council’s flagship West-East route, Roseburn to Leith via George Street, runs through Picardy Place. 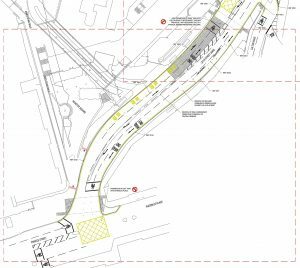 It must be direct and of high quality – but in the current plans it is seriously indirect, and its quality is compromised by diversion through a small and constricted pedestrian/cycle traffic island at the John Lewis corner. See this map illustration by Spokes member Chris Paton. Other issues – our submission also covers several other important issues. 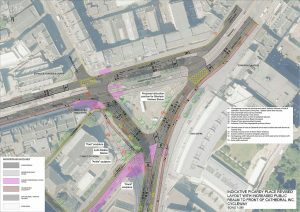 On the other hand, if the gyratory is scrapped, then a better solution for cycling is possible – and a far better solution for pedestrians – albeit with a significant delay whilst new plans are drawn up and consulted on. Please make a personal submission to the consultation, emphasising the main points important to you – it does not need to be lengthy – a short email of main points is very worthwhile. The Council consultation page is here and, for ease of reference, the consultation map is here. These and other useful links are also on our Leith Walk web page here (para 1711). You can respond either using the online form on the Council consultation page or by sending an email to Craig.McConnell@edinburgh.gov.uk saying that this is your response to the Picardy Place consultation. The current 10-month closure of Leith Street appears to be working reasonably well now that it has settled in. The recent Spokes traffic count near Greyfriar’s Bobby found a smaller rise in diverted motor traffic than might have been expected and it seems likely that some former motorists are now using alternate modes or alternate opportunities rather than driving on circuitous routes. As with Picardy, Leith Street will be intimately involved in the City Centre Transformation, with the possibility that it could be permanently closed to through motor traffic other than buses. We therefore urge that the present car ban is maintained until the Transformation outcomes become clearer – buses should return to Leith Street as soon as possible, but it makes no sense to allow motorists to re-habituate themselves to using Leith Street if that may not be a long-term prospect and if meantime Leith Street could be a really people-friendly street. It should also be noted that once buses are allowed back into Leith Street any car congestion on diversion routes will therefore be reduced. If, nonetheless, any residential streets have become rat-runs, then closure at one end of such streets should be considered. The Leith Street closure is for 10 months whilst St James works take place, and unless Councillors act it will reopen to all traffic at that time. If you would like the closure to continue, at least until the Council’s City Centre Transformation project reaches some conclusions email your Councillors as soon as possible. Ask them to raise your concerns with the Transport Convener, Cllr Lesley Macinnes, and with the Council’s Transformation working party which we understand is now being set up. cycling down Leith Street, there is no obvious way to join the segregated route which will run from Calton Road down to and along Leith Walk. Are you intended to use the gyratory?! James Craig Walk is to become an important pedestrian/cycle route (to the new St James, possibly in future to/from St Andrews Square, and to York Place). A quality connection to Leith Street is essential, but not shown. You can comment or object without going through the detail of the Orders, but if you wish to see them in detail they are on this Council page or click direct on RSO/17/13 and TRO/17/81. The RSOs say what parts of the street will be carriageway, cycleroute and footway, whilst the TRO covers things like bus lanes and parking restrictions. Unlike the above Picardy consultation, there is not an online consultation form. 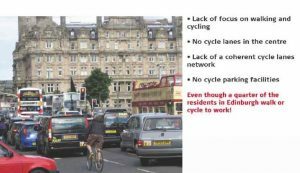 Instead, you send objections by email to trafficorders@edinburgh.gov.uk. If you wish to object just send one email, saying you object to both orders and quoting their above reference numbers. Then state your reasons and why it matters to you – either just a few bullet points or going into more detail. It is important to say ‘object’ rather than just ‘comment’ as this makes a public inquiry more likely. Please also forward your email to spokes@spokes.org.uk.